It's strange to think that after only a week of living in Sevilla, I am beginning to really become comfortable with the city and way of life! It's been nice being able to finally start getting into a daily routine and getting used to some of the different customs, like eating lunch at 3pm and dinner around 9pm (not going to lie- snacking has become somewhat of a necessity). Also, after about a week of orientation activities and getting to know the other students in the program, classes have begun. Since it's not every day that I get a chance to study in Spain, I have decided to jump right in and take all of my classes in Spanish (wish me luck)! This semester I'll be taking Spanish Phonetics, 20th Century Spanish Literature, Spanish Culture in Cinema, Artistic Monuments of Sevilla and Flamenco Dance. I'm sure adjusting to thinking, speaking and learning in Spanish will be difficult at first, but surely worth it in the end! The Artistic Monuments in Sevilla class is the one I am most excited for as it gives us a chance to take advantage of all the history that Sevilla has to offer. Each day of class we venture out into the city on a different field trip, visiting everything from museums and monuments to palaces and cathedrals. 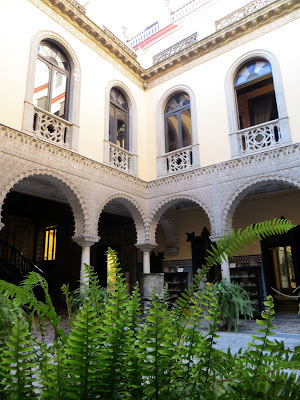 This week we had the chance to visit el Palacio de Lebrija (Lebrija Palace), an old residence in Sevilla known for its extensive collection of Roman art from the 16th century. Also on the top of my list is the Flamenco Dance class that meets twice a week and, if nothing else, is a good source of entertainment! Nearly everyone in the program has decided to sign up for the class, even a few of (braver) boys! Hopefully, by the time Feria (a week-long cultural festival centered around music and dance) comes around mid-April, we'll all be ready to strut our stuff. Besides getting used to the class schedule, we've also gotten a taste of just how busy SAIIE will be keeping us with different cultural activities! Each day there is a different opportunity for us to get involved in a typical Sevillian activity or get to know the city a bit better. This week, Maria Angeles, the Student Affairs Assistant, planned a shopping trip for the girls in the program. She brought us around to all the hot spots and best places to shop for the best deals and cutest Spanish fashions. Friday night was also the start of an ongoing semester-long cultural activity known as Ruta de Tapas (tapas tour). 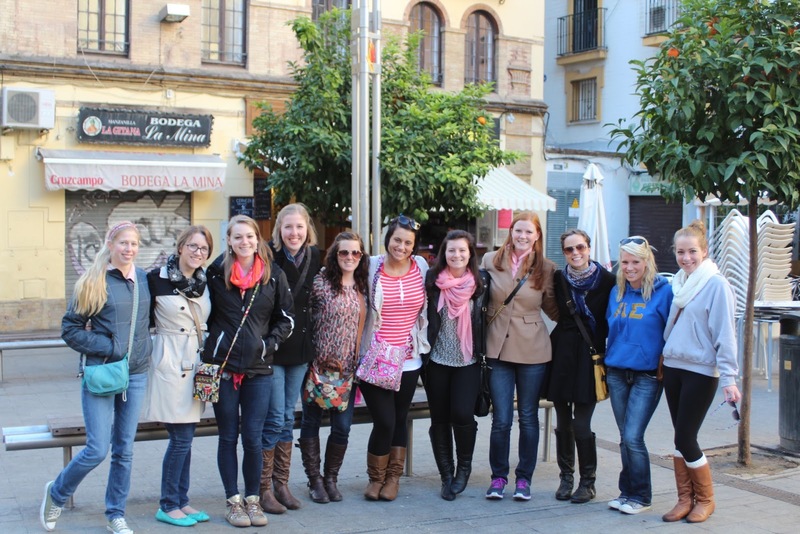 A couple times each month until the end of the semester, Samantha, the Student Affairs Director, and Maria Angeles will be bringing the group around to a different barrio (neighborhood) each friday night to sample a few of the best and most traditional tapas that area has to offer! This past Friday, we stayed close to our school and checked out a few of the tapas bars in that neighborhood, called Alfalfa. We had the chance to try some delicious montaditos (mini sandwiches) and huevos fritos (fried eggs served on top of french fries with tomato sauce or chorizo). I can already tell that this will probably be one of my favorite activities to look forward to, and not just because it involves food! Thanks to Sam and Maria Angeles, we'll have a chance to steer clear of the tourist traps and see all the amazing food this city really has to offer! To finish off the week, a group of us decided to venture over to Triana, the area of the city on the other side of the river, for dinner. We ended up at a beautiful open-air restaurant right on the side of the river, looking out onto the calm water and light-up city. While we probably ended up paying a bit too much for the sangria, the experience made it all worth it!